Where do you get these fights from anyway? o_O Good finds! EDIT 2: Yoshi has AWESOME customizations!! Besides Yoshi having awesome outfits and extras, his new fighting style and different stances are great too. He can actually put his sword away ?! 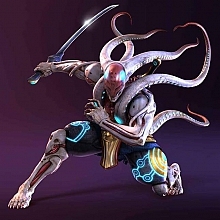 btw, the name of the account is "ShogunTemplar" and I find it very interesting to watch, especially its Yoshimitsu! ITs full of yoshi fights! Yoshi will finally be able to FIGHT, to punch! He just lacked that in the other games. no problem Gattsu! always happy to help! Awesome!! I love watchin T6 videos especially with Yoshi!